When most people think of traveling to the west coast they think of the sunny beaches of southern California and forget about what the west coast has to offer further north. A road trip through Oregon and Washington provides a multitude of things to do along with some beautiful scenery as you go. There’s no shortage of natural wonders and national parks between the two states, so a nature buff is sure to enjoy this spring break adventure. In Washington, one of the most diverse tourist destinations is Olympic National Park. The national park is home to many wonders including, forests, beaches, waterfalls, and mountaintops. The Hoh Rain Forest is a lush, mossy example of the beauty that exists within the Olympic National Park and is a great location for hiking. Further south in Washington, and near the Oregon border, is Mount St Helens, a volcano that violently exploded in 1980 and now is a national park. Still active, Mount St. Helens makes for an interesting and educational visit. 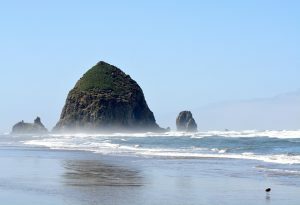 After entering Oregon, just beyond the border is Cannon Beach. This beautiful beach runs along the Pacific Ocean and includes beautiful rock formations scattered near the shore. Lastly, towards the southern side of Oregon, lies the Umpqua National Forest. This forest houses beautiful, secluded hot springs that tourists frequently take a dip in during their visit. The natural hot-tub-like pools provide an area to relax while looking out into the beautiful and vast scenery of the forest. Oh, and don’t forget to stop at VooDoo Doughnut in Portland on your way through Oregon for a tasty treat!